Partner LL.B., Dip. L.P., N.P. Gary is our law firm’s Training Partner. 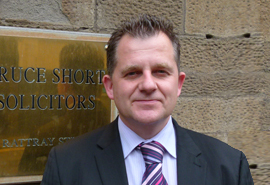 He regularly appears for clients in courts throughout Scotland in criminal matters and conducts parole hearings to the Parole Board for Scotland for Determinate Prisoners and Extended and Life Sentence Prisoners. Gary can also act as a Notary Public.